ClearView Geophysics Inc. specializes in snowmobile-mode surveys which are generally less expensive and higher quality compared to walking-mode surveys. 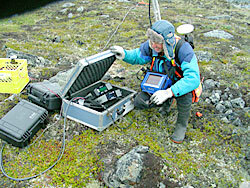 However, walking-mode surveys are required in areas located below the tree-line, in extremely rugged terrain, or when snow cover is inadequate. Certain surveys can only be carried out in walking-mode. These include Spectral IP & resistivity surveys, seismic surveys, and other methods that require the insertion of probes into the ground. However, GPS is commonly used for navigation and positioning, eliminating the need for cut and chained survey lines in many cases.